A few weeks ago I was approached by leavershoodies.com. Based in Brighton, the company specialises in making custom clothing, from hoodies and t-shirts to jackets and even onesies. 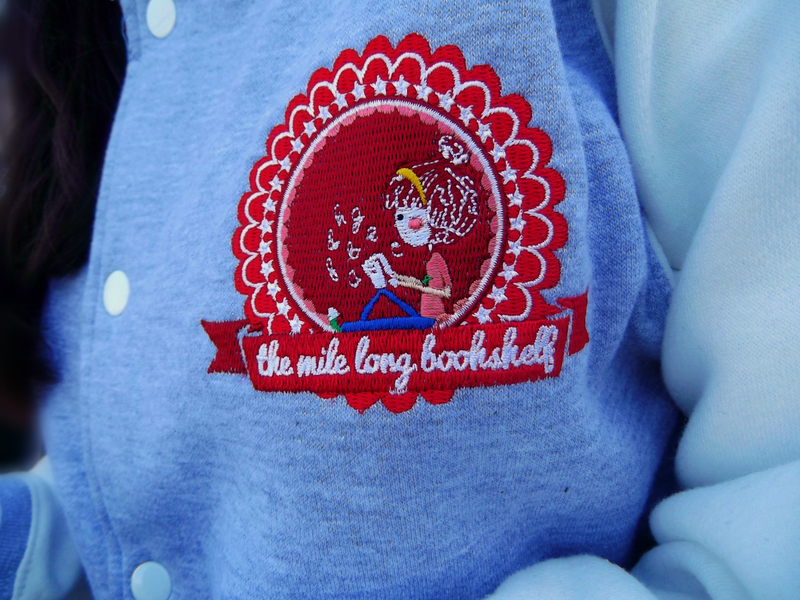 They asked if I would like them to embroider my blog logo on a clothing item of my choice in return for a review, and I jumped at the chance. I'm not a fashion blogger. I've never reviewed a piece of clothing in my life. In fact, I've never reviewed anything other than books. But the woman who contacted me was lovely and clearly enthusiastic about the company, and... well, I've never had the chance to wear my blog logo before. I knew writing the review and taking the photographs would be a challenge, as I'm not exactly a fan of being in photos, but sometimes it's good to take on a challenge and try something new. And, considering I've been reviewing books and only books for the last five-and-a-half years, I thought, why not? After browsing the many, many clothing options - seriously, go and have a look, there are tons - it was time for me to pick a colour scheme. 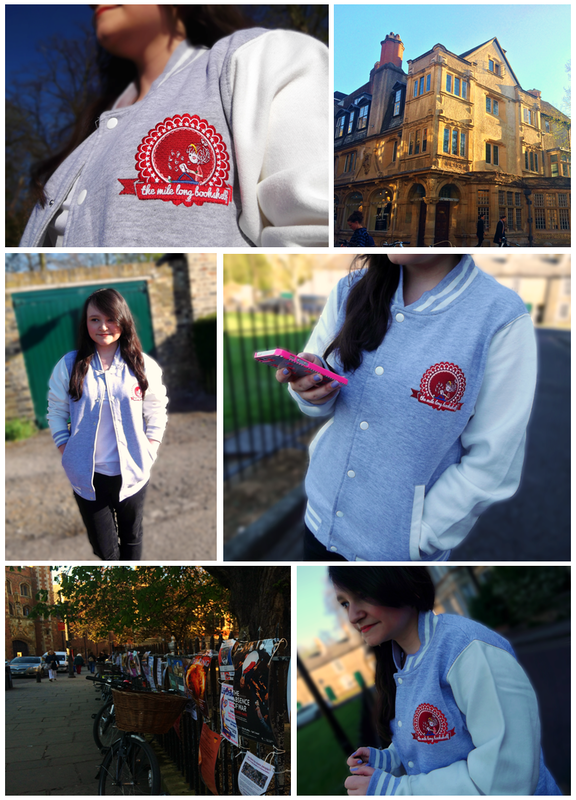 Considering there are 56 colour options, it took a while, but I finally settled on one of their varsity jackets in the colours white and heather grey in size Adult S.
After sending off my blog logo, I sat and eagerly awaited its arrival. It can take up to two weeks maximum for your order to be produced and posted, but it only took a week for mine to get from production to my letterbox. Anna, the woman I was in contact with, kept me updated every step of the way and is one of the nicest people I've dealt with through my blog. I already had a logo to go on the jacket, so I didn't have to worry about that. But you might not have one. Luckily, that's not a problem - if you have an idea for a design, just let the leavershoodies.com team know and they'll work on it until you're happy. How awesome is that? Previously, I hadn't been sure of what to expect. I've had custom hoodies before for school things I was involved with, and they always looked so cheap and were horrendously sized. This isn't one of them. In fact, leavershoodies.com puts all the other custom clothing companies to shame. I was so impressed. Despite my logo being as detailed as it is, they have embroidered it to perfection. I still can't get over that. Not to mention that it fits perfectly, is extremely well-made and is easily the cosiest item of clothing I own. It's fleece inside, people. Fleece. I want to wear it forever. Too right I do - it was a pleasure to work with them, and the jacket is a pleasure to wear. If you're a blogger, it's really cool being able to wear something with your logo on it, but this certainly isn't limited to bloggers. The possibilities are endless. This is so ridiculously cool! Your logo looks so great and I love the fact the inside is fleece. The company sounds great. This is so cool! I love having custom made stuff like this! That is ridiculously awesome. I'd love to have something like that (well, if I actually had a blog logo, which I don't. Too much effort). Fair play on doing the photos too, I'm not a big fan of being in photos either, I someone to always look like I'm high. I think this really shows that people are noticing your blog so I wish you the best from here on in! That is SO COOL!! I can't believe how accurate they got it. Brilliant service and it looks so cosy too! I know, I'm still amazed! This is so awesome! It looks exactly like your blog logo and looks like such good quality!! This is so cool! I'd definitely have to place an order if I thought that I would wear it often enough (I'm a creature of habit - it's rare to see me in a jacket other than my denim one). It looks like great quality though and it's so beautiful! Great post.